San Francisco Mayor London N. Breed, Supervisor Hillary Ronen and community leaders held a groundbreaking yesterday for Casa Adelante, a nine-story building located at 2060 Folsom Street that will provide 127 permanently affordable apartments for low-income households, including 29 units for homeless transitional age youth and parenting youth. “We need more projects like Casa Adelante in San Francisco in order to create the affordable housing our residents need,” said Mayor Breed. The ground floor of Casa Adelante will feature community-serving uses overlooking the new, adjacent In Chan Kaajal Park. 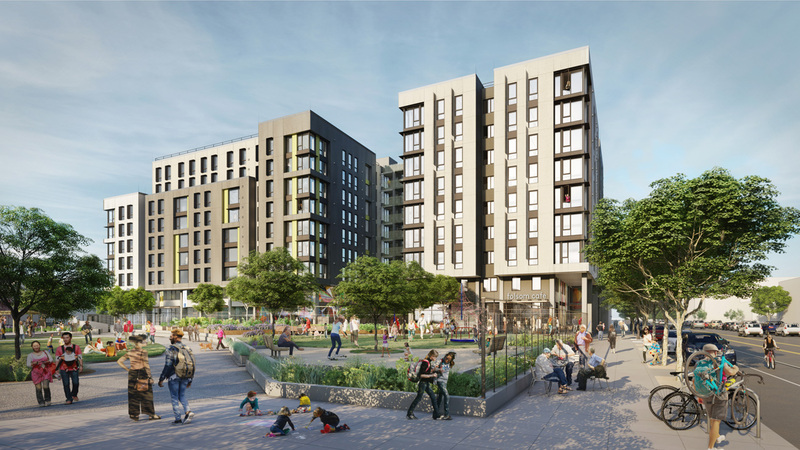 Casa Adelante – 2060 Folsom will offer residents and the public birth-to-career resources ranging from a preschool to after-school programs and activities for youth and young adults. Proposed service providers with on-site offices will include PODER, Good Samaritan Family Resource Center and Mission Graduates, while Larkin Street Youth Services and Chinatown CDC will also provide family-strengthening services. Programs will be open to residents and the surrounding neighborhood. The Mission Economic Development Agency (MEDA) and Chinatown Community Development Center (Chinatown CDC) are the joint-venture nonprofit developers. “I love this project!” said The Rev. Norman Fong, the executive director of Chinatown CDC. Mithun provided integrated design services including architecture, interior design and landscape architecture. Y.A. Studio is the associate architect. The general contractor is James E. Roberts Obayashi Corp. Financing sources include the San Francisco Mayor’s Office of Housing and Community Development, US Bank Community Development Corp, California Tax Credit Allocation Committee, California Debt Limit Allocation Committee, California Department of Housing and Community Development, and the Strategic Growth Council. Casa Adelante’s anticipated move-in date is in fall 2020. View the press release for additional information.